Welcome to Astro-Stone.com, our directory of Astrology and Horoscope information. Since the earliest times, people have looked up to the heavens and wondered if we could see our destiny and our future written in the stars. Prehistoric societies, built vast monuments, such as Stonehenge (located in Southwest England) that were carefully aligned to the positions of objects in the sky. Later still, many of the civilizations of antiquity, including the Sumerians, Egyptians, Babylonians and Greeks, made astronomical observations and kept astrological records. During the Medieval period, and later, during Renaissance times, astrology continued to be held in high regard. Scientists of these times, many of whom are still revered today, such as Copernicus and Galileo, not only were astronomers (making scientific observations of celestial objects), but were also practising astrologers (using the heavens as a method of predicting events ad perhaps the future) - indeed, it is only in quite recent times that the two fields have become full distinct from each other. During the modern period, astrology eventually become a distinct field of study, separate from astronomy, but also gradually went into decline. On the other hand, in Eastern countries, such as India and China, astrological traditions and culture have remained strong. In the last few years, astrology has once again recovered some popularity in Western countries. It is now not uncommon to see astrological columns in many newspapers and magazines. Different people of course have different opinions on the subject of astrology, and many people are skeptical. Indeed, as far as the state of knowledge is today, as far as we are aware, there is no scientific proof that astrology is either accurate or effective. Nevertheless, even for skeptics, astrology can remain a fascinating and interesting subject. Horoscopes and astrological information by sign of the zodiac: Aquarius, Aries, Cancer, Capricorn, Gemini, Leo, Libra, Pisces, Sagittarius, Scorpio, Taurus or Virgo. Magazines about astrology and horoscopes. Other web sites with astrology information. 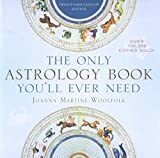 This new edition of The Only Astrology Book You’ll Ever Need is packed with updated information on Sun signs, Moon signs, Ascending signs, the placement of Planets in your Houses, and the latest astronomical discoveries. This book provides the compatibility between every sign (144 combinations) and dispenses advice about health, money, lifestyle, and romance, while also offering advice on dealing with the negative aspects of each sign. This edition also takes an even closer look at the inner life of the individual and the emotional needs that motivate a person. Chapters include a look back on the history and mythology of astrology as well as the newest developments in astronomy. This is an indispensable source book for unlocking the mysteries of the cosmos through the twenty-first century and beyond. Follow master astrologer Steven Forrest on an astrological journey into the realm of both darkness and the powers that can transform it: the planetary body Pluto. Whether officially named a planet or not, astrologers everywhere agree that Pluto is a major force. With this groundbreaking work, Steven emerged as one of the foremost voices merging astrological practice with the most courageous forms of humanistic psychology. Upon its initial publication, DELL Horoscope magazine described him as "not only a premier astrologer, but also a wise man." Written with both the astrologer and the layperson in mind, his words convey practical and useful information that will help anyone navigate Pluto’s labyrinthine passages. Along with detailed cookbook-style explanations of Pluto in the houses and signs, the reader will also find comprehensive information for working with transits and progressions. This book is your one-stop shop for all things Plutonian. But most of all, it’s a beacon of light in some famously dark terrain, pointing the reader towards the transformative gifts Pluto can bear, if we choose to face our lives with consciousness and compassion. This revised second edition includes new Introduction and Afterword. Many have suspected that your birthday affects your personality and how you relate to others. Nineteen years and over one million copies later, The Secret Language of Birthdays continues to fascinate readers by describing the characteristics associated with being born on a particular day. The 366 personality profiles are based on astrology, numerology, the tarot, and Gary Goldschneider’s observations of more than 14,000 people. Your strengths, weaknesses, and major concerns will be illuminated while you are given practical advice and spiritual guidance. After you study your profile, it will be hard to resist examining those of family, friends, colleagues, and even celebrities. Astrology for Yourself<?/i> is designed to introduce you to the language, art, and science of astrology through a series of self-directed, program-learning exercises that will literally enable you to write your own chart interpretation. Aside from providing you a wealth of knowledge about your birth chart, Astrology for Yourself promises to promote personal growth and change your life. Modern Astrology offers a new, self-developmental approach to astrology with skills and strategies to take control of your life path and purpose. Astrology is a cosmic blueprint of who you are and what life holds, but it is not set it in stone. Leaving predictions to the past, Modern Astrology uses a contemporary psychological approach to decode your life’s path and promote positive, personal growth through actionable skills and strategies. To unlock your potential, this astrology reader interprets the planets, signs, houses, aspects, and transits in your natal chart as keys to your life purpose. Armed with this self-awareness, Modern Astrology offers guided, developmental exercises and tactics to successfully navigate the trials and obstacles in alignment with your sign. Astrology and psychology 101 that offers a basic understanding of astrology and its evolution into a field of self-help and psychology. Zodiac readings that provide in-depth explanation of the personality traits associated with every sign. Personal growth exercises that include soul-searching shamanic meditations, strategies to address obstacles associated with each sign, journaling prompts, and more! Astrology holds the answers to many of life’s questions―but only you have the power to act on them. In Modern Astrology, you’ll discover who you are, what you want, and what you need to do in order to be the best version of yourself. The easiest way to learn astrology is to start with yourself. Your astrological birth chart is a powerful tool for gaining a deeper understanding of your unique gifts, talents, challenges, and life's purpose. As you begin to decipher the wealth of information in your own birth chart, you'll experience astrology in a personally meaningful way-which makes it easier to understand and remember. Once you learn the basics of astrology, you'll be able to read the birth charts of yourself and others. This friendly guidebook is the most complete introduction to astrology available. Popular astrologer Kris Brandt Riske presents the essentials of astrology in a clear, step-by-step way, paying special attention to three areas of popular interest: relationships, career, and money. She explains the meaning of the planets, zodiac signs, houses, and aspects, and how to interpret their significance in your chart. Over 30 illustrations, including the birth charts of several famous people―Al Gore, Oprah Winfrey, Brad Pitt, and Tiger Woods, to name just a few―add a helpful visual dimension to your learning experience. Practical and positive, Llewellyn's Complete Book of Astrology offers techniques for using astrology to identify the qualities you seek in an ideal mate, realize your career and financial potential, calculate your luck, and discover your inner strength. Deeply entwined for six centuries, the art of tarot and the science of astrology have an undeniably powerful link. With this unique and user-friendly guidebook, you can easily learn to combine tarot and astrology for yourself―and expand your tarot practice while enriching your life.